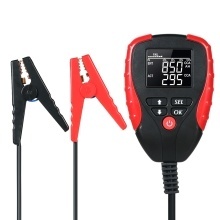 This automotive battery tester is mainly used to test and analyze 12V battery including CCA Value, AH value, voltage, internal resistance and battery life percentage. It can be widely applied to measure various types of 12V storage batteries. Very easy to understand and use even for beginners. Analysis 5 accurate battery indexes of voltage, resistance, AH(battery capacity), CCA value and battery status. Large LCD display with bright backlight to show the results clearly when testing 12V battery. Come with a pair of heavy duty battery clamps, convenient to test car, motorcycle, vehicle, boat battery condition. Built-in beep remind function, makes it more reliable when test and analyze finish. Wide CCA test range(0～1995) & AH range(0～199.5), offers more flexibility to battery choice.